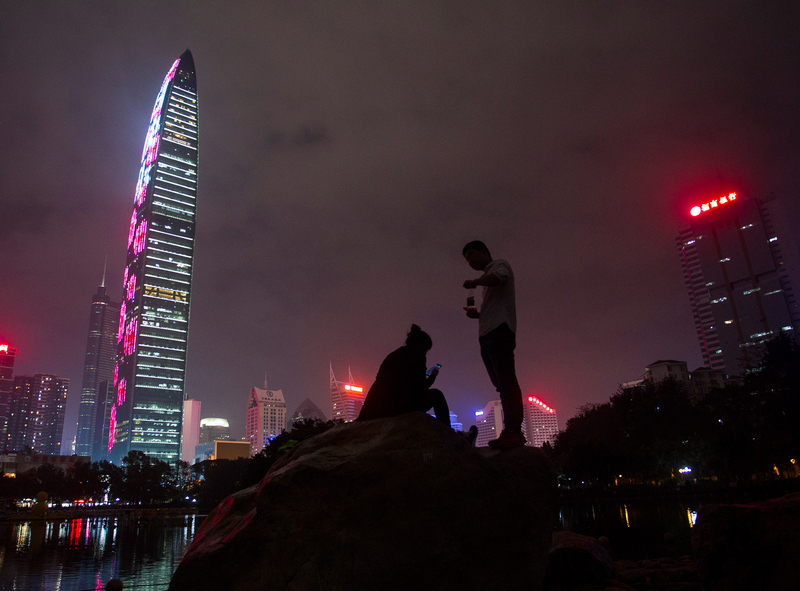 People at a park surrounded by skyscrapers, in Shenzhen, March 8, 2016. Three key characteristics marked China’s post-1978 reform era: 1) rapid economic growth; 2) ideological openness; 3) relative stability, marked by partially-institutionalized political norms such as elite succession practices and the Party’s retreat from day-to-day management of government and society. These characteristics are now disappearing. China is slowing down economically. And it is closing up ideologically, as Party authorities have steadily turned against influences deemed “foreign” in religion, culture, and academia. Far more disturbing, top authorities are systematically undermining the political norms that figures such as Deng Xiaoping built in the early reform period to guard against the governance failures and horrors of the Maoist era. Single-man rule is returning and the Party is steadily reabsorbing state institutions. Maoist practices of the past—staged public self-confessions and mass extra-legal detentions directed at broad swaths of society—are resurfacing. These developments are troubling for those concerned with China’s development. Rather than progressing towards a better future, as was once the hope with China’s reform and opening, the country may instead be on course to relive some of the worst parts of its own 20th-century history. In labor relations, there is little evidence of any “reform” or “opening” since Xi took power. Recent developments are far more suggestive of a tightening and clamping down. Although China continues to experience a significant (but unknown) number of labor disputes each year, its strategy for addressing them has not significantly evolved. The government remains willing to assist individual workers in accessing the courts, and some legal aid programs have even expanded. However, when collective worker actions arise, local governments still commonly quell the protests. Any progress on creating labor organizations that are trusted by workers and could help peacefully resolve disputes, or even prevent them, remains elusive. For instance, labor advocates have long called for the All-China Federation of Trade Unions (ACFTU)—China’s monopolistic, state-dominated trade union—to institute free elections at local branches or to allow alternative worker groups to form. Neither has occurred under Xi. The ACFTU pays lip service to democratization, but there has been little action. The independent labor NGOs that assisted workers in resolving collective disputes, and operated outside the official union structure, were somewhat tolerated under then Chairman Hu Jintao but fell victim to a serious crackdown in 2015. The recent incident with workers at a Shenzhen factory for Jasic Technology illustrates the current state of labor relations. At this welding machinery factory with over 1,000 employees, workers faced arbitrary fines, suffered verbal and physical abuse, and were sometimes compelled to work a month straight without time off. One employee called it the worst factory he ever worked at. However, when workers sought to address these issues by working with the local ACFTU to establish a trade union, management preempted the effort by forming a union to which it appointed the officers and retaliating against the worker leaders by transferring, beating, and eventually firing them. The ACFTU provided little assistance. Instead, weeks of employee protests ensued, which prompted the police to initially detain nearly 30 people. Detainment came to include not only the laid-off workers, but their families and other supporters as well. Many were charged with crimes and denied access to lawyers, and at least four individuals remain in prison. What made headlines is that these supporters included students and graduates from some of China’s top universities, such as Peking University and Renmin University. Hundreds posted letters on social media; dozens traveled from Beijing to Shenzhen to protest the police detentions. The government’s response? Continue the crackdown by leaning on the students’ university professors and their parents in order to pressure them to stop demonstrating. Renmin University also took disciplinary measures against some of the protesting students. Seeing these retaliatory measures, Cornell University found that these acts impermissibly violated academic freedom, causing the school to cancel its existing exchange programs with Renmin University in late October. This case highlights several key elements of labor relations under Xi: independent unions remain off-limits, democratizing local ACFTU branches is discouraged, worker protests are met with a police response, and those seeking to assist protesting workers are subject to repression. It is hard to argue that such policies constitute reform or opening in any meaningful sense. Correction: This comment has been updated to clarify the relationship between the Jasic Technology unionization and the ACFTU. “Reform” has been the key positive word in Chinese political discourse for the last four decades. It replaced “reconstruction” in the official Mao era lexicon. It’s like the word “new” used in Western political language—a term that everyone deploys without great risk and likes. Yet no one knows precisely what it means. When Chinese President Xi Jinping employs “reform,” he is conveying a specific idea about his legitimacy: I am the heir of Deng Xiaoping, the great architect of change, and I stand in this grand tradition. As the “core” of the fifth generation of Chinese leadership, a title he bestowed on himself only a couple of years ago, Xi can cement his legitimacy by appropriating the one term so closely tied to Deng and his great post-Maoist mission. He is seamlessly carrying on the task started in the post-Mao era by his great predecessor. To Xi’s credit, reform and its evolution in meaning has more than just lexical connectivity. “Reform” to Deng, just as much as to Xi, denoted economic enrichment as a means to deliver one overarching aim: sustainable one-party rule. To preserve his commitment to this ideal, Deng ordered troops into Tiananmen Square in 1989, destroying the fond image of him as a closeted democracy promoter that some had held until then. The relentless centralization of power and the crushing of all forms of even the softest dissent demonstrate that Xi belongs to the same vintage. The Party comes first, last, and everywhere in between; everything else contributes to its prosperous development. “Reform” also means a strong commitment to the commanding role of state enterprises and the state system. Deng tolerated non-state players, the market, and entrepreneurialism as means to this end, just as Xi evidently does. That end is a nationalistic one—the creation of a great and powerful country. The only difference is that Deng initiated the process while Xi is presiding over its maturity. All this makes clear that for Xi and Deng, the real meaning of “reform” is not the support for transformative processes that lead to political liberalization along western lines, but instead the reinforcement of the Chinese socialist system put in place after the conclusion of the civil war in 1949. “Reform” meant lower-level change to preserve something more important higher up: the entrenchment of China’s political system. This presents a great paradox of today’s reform language and process which, at heart, are deeply conservative—defense of the legitimacy and rights of the Party to complete control and power. “Reform” just signifies developing better means and more efficient methods to reach that goal, but the goal for Xi remains the same as it was for Deng. China’s early November review before the U.N. Human Rights Council is a fitting time to pause and remember the human rights advocates who took to the streets four decades ago. As top leader Deng Xiaoping introduced the “Four Modernizations” in December 1978, Wei Jingsheng plastered the “Fifth Modernization” to the Democracy Wall in Beijing. He then spent 18 years in prison for counter-revolutionary activities. Xi Jinping declared in October that “China’s reform and opening up will never stop.” Today on the policy’s 40th anniversary, nor has the Party-state’s suppression of human rights advocacy ceased. To be sure, the reforms ushered in by Deng were never meant to be about human rights, made most dramatically clear by the massacre in 1989 of protesters in Tiananmen Square and far beyond. Nonetheless, as China watchers evaluate trends in economic and policy realms, so too should we analyze trends concerning human rights. We can only speculate what “reform and opening” really means to Xi personally, but we can observe the words and acts of the Party-state, which indicate dual, complementary trends with respect to human rights: rather than “reform and opening,” we see “repression and obliteration” at home and “redefinition and obfuscation” abroad. Inside China, the Party-state is repressing citizens who exercise their rights—and the lawyers who advocate for them—and restricting the space for non-governmental organizations. It is implementing policies aimed at the forced assimilation of Uighurs and other ethnic minorities, and the concomitant obliteration of these groups’ cultures. Outside China, the Party-state is promoting a “no one-size-fits-all” approach to human rights that attempts to redefine (and, in the process, water down) international norms. In calling for a “path of human rights development with Chinese characteristics,” the government obfuscates what is occurring by depicting mass internment camps as centers for “vocational training” that are used to combat extremism.